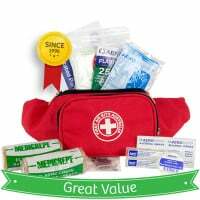 Our K160P is a general purpose First Aid Kit for most situations. This kit has the same contents as our very popular K160, but it is PINK ! The K160P is dust proof with an internal plastic covering of all the contents. The K160P is great for bush walking, adventure races, security work, camping and many more outdoor activities that require a dust proof and water resistant First Aid Kit. It also stands out from the crowd which maybe important when trying to identify your First Aid kti quickly. Size Medium Colour Pink ! !